So, the workers’ compensation adjuster told me that I am no longer going to get my weekly benefits because she says I am “at MMI.” What does that mean? And is she right? “MMI” is shorthand for the term “maximum medical improvement.” In 2017, that term was specifically defined in Setion 287.020 RSMO as follows: “For the purposes of this chapter, “maximum medical improvement” shall mean the point at which the injured employee’s medical condition has stabilized and can no longer reasonably improve with additional medical care, as determined within a reasonable degree of medical certainty.” In other words, when the doctor says no further care will improve your condition, you are at “MMI.” In 2017, the workers’ compensation law was amended to state clearly that TTD or TPD benefits shall be paid throughout the rehabilitative process “until the employee reaches MMI, unless such benefits are terminated by the employee’s return to work or are terminated as otherwise specified in this chapter.” ​Sec. 287.149.1 RSMo. The adjuster is right. If you have reached MMI and no further care will help you, they can terminate those weekly benefits, even if you don’t go back to work right away. Of course, you are still entitled to receive compensation at the conclusion of your case for permanent partial or permanent total disability, but that could be many months after your temporary total (weekly) disability benefits end. If you disagree with the doctor that you are at “MMI,” you will need to get an opinion from a different doctor contradicting that opinion and seek a hardship hearing if you want to contest that determination. Do All Missouri Employers Have to Carry Workers' Compensation Insurance? Not all employers have to carry workers' compensation insurance in Missouri. If a company has less than five employees total, that employer does not have to carry workers' compensation insurance. There is an exception to this rule for certain construction contractors, who must buy workers' compensation insurance even if they have only one employee. However, an employer with less than five employees can still elect to be covered under the Missouri Workers' Compensation law by purchasing insurance. 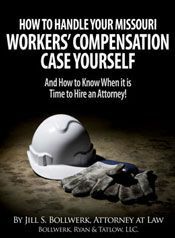 Many small employers want to do this, even though it is not required, because purchasing workers' compensation insurance prevents the employer from being subject to getting sued in state court if their employees become injured on the job. Employees who work for covered employers can only bring an action against their employer for their injuries in the workers' compensation tribunal. I received weekly workers' comp benefits last year, but did not get a W-2 or 1099. Do I have to pay taxes on those benefits? My employer is making me take vacation time to go to a medical evaluation with their chosen work comp doctor. That doesn't seem right. Can they do that? Unfortunately, that is true. Under Section 287.140.14 RSMo., the employer may require an employee to use accrued vacation or sick time to attend medical appointments, physical rehabilitation or medical evaluations during regular work time--even if they are scheduled by the employer or its workers' compensation carrier. This does not apply to medical treatment you receive when you are out of work and receiving temporary total disability benefits. It only applies to appointments that are scheduled when you are back to work after an injury. I was hurt at work and the doctor says I cannot work right now. My employer is fighting the workers compensation case and so I am not being paid for my time off work right now. I need money! Can I file for unemployment? Filing for unemployment can be a bad idea if you are off work due to a work-related injury. First of all, in order to apply for unemployment, you have to certify to the unemployment folks that you are ready, willing and able to work, which is not true if a doctor has ordered you off work. This can truly affect your credibility at the hearing of your workers' compensation case. Second, Missouri Workers Compensation law states that an injured worker is disqualified from receiving temporary total disability benefits during any period of time "in which the claimant applies and receives unemployment compensation." Section 287.170.3 RSMo. This means that if the employer eventually accepts your claim, or if you win your claim at hearing, you will not be able to collect temporary total disability benefits during the weeks you also received unemployment benefits. At the time of this writing (9/20/14), Missouri's maximum unemployment benefit is $320.00 per week. On the other hand, the maximum weekly temporary total disability benefit is 2/3 of your average weekly wage,up to a state maximum $861.04. You should find out what your weekly unemployment benefit would be versus what your weekly workers' compensation benefit would be before you decide to disqualify yourself from receiving temporary total disability benefits by applying for unemployment. I was injured in an auto accident and I am on Medicare. Who should be paying my hospital bills? When you are injured in an accident in Missouri, it can be difficult to figure out where to have your medical bills sent. If you are on Medicare, it can be even more difficult, because Medicare is not supposed to pay for anything that is the responsibility of another carrier. However, an automobile liability insurance carrier for the at-fault driver is not going to pay your hospital bill for you, and they won't give you any money at all to pay that bill until you are ready to settle your case. That could take months--even years. Most hospitals are not willing to wait long periods of time to get paid, and you should not have your credit ruined as a result of an unpaid hospital bill. In this circumstance, Medicare will make a "conditional payment" on that hospital bill if the auto insurer will not pay promptly. A conditional payment is just that--it is a payment conditioned on the fact that Medicare be repaid for the payment at the time your case is resolved . For instance, if Medicare paid $5000 on your hospital bill, they will have a right to be repaid that $5000 when your case resolves. So if you are hospitalized after an accident, you should still give the hospital your Medicare card so that they can bill Medicare if your case doesn't settle quickly. I have been off work for four months for a back injury and now my employer tells me that they don't have to hold my job for me any longer because I used up all of my FMLA time. Is that right? Unfortunately, that is not an untrue statement. The FMLA guarantees qualifying employees twelve weeks of unpaid medical leave each year. If an employee returns to work before the end of the 12-week period, the employee has the right to be restored to the same or equivalent position with equivalent pay and benefits. An employee may receive compensation while on FMLA leave either through using his or her sick time or vacation, or through workers' compensation payments. However, an absence due to a work injury that is covered by workers' compensation benefits may run conncurrently with FMLA leave. Therefore, if you are off work longer than 12 weeks for a work injury, your job may no longer be protected under the FMLA, even if you are out on workers' compensation leave. However, there may be other employment laws that may afford you protection, so consult a lawyer if you find yourself in this position.